There are days that I think I might become a vegetarian. I’m not a fan of preparing meat because I don’t like to touch it raw and I have to be in the mood to eat it (as weird as the latter part might sound). However, there are times when I crave meat. Like a lot. You know, because it’s delicious. This time my craving led me to chorizo, a delightfully spicy sausage that is common in Spanish cuisine. The result was this outrageous pasta dish that will keep you coming back for seconds and thirds. 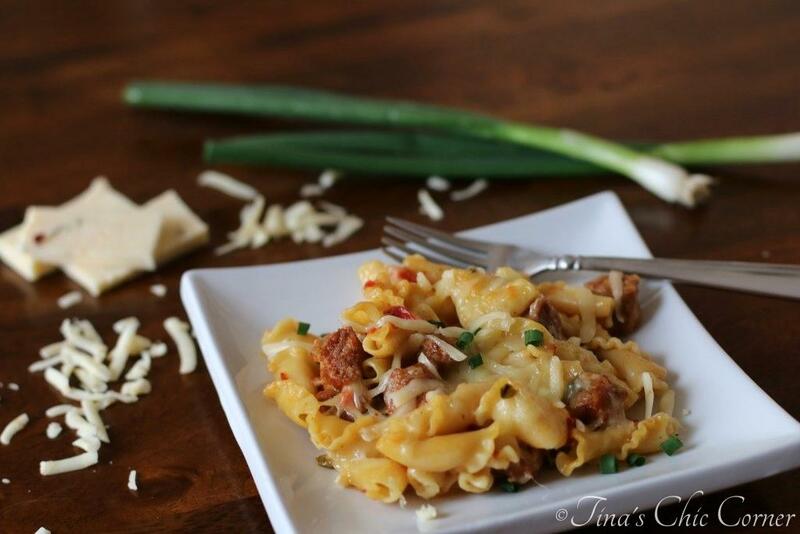 This pasta has a creamy pink sauce and is loaded with spicy goodness of chorizo and Pepper Jack cheese. 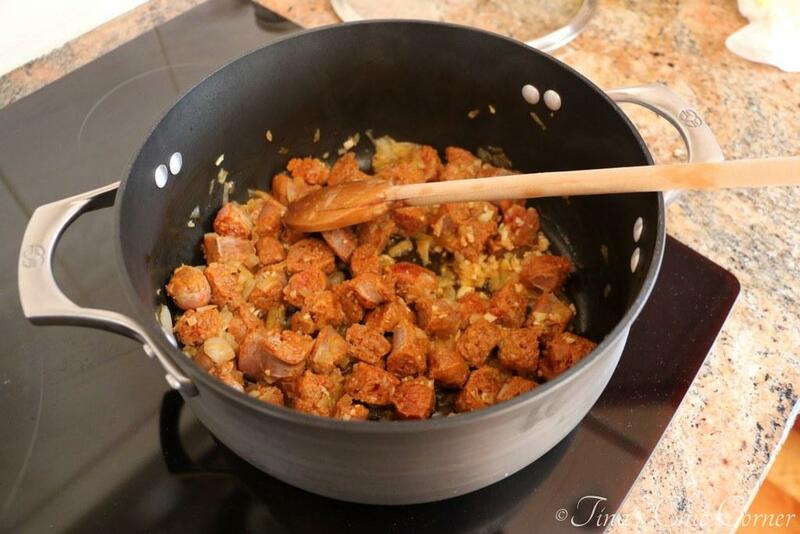 In a large pot over Medium heat, cook the sliced chorizo and finely chopped onion until the chorizo sausage is lightly browned (about 8 to 10 minutes). Add the minced garlic and cook for about 1 additional minute. Stir in the chicken broth, can of diced tomatoes and green chilies, heavy cream, dry pasta, salt, and pepper. Raise the heat and bring it to a boil. Once it reaches boiling, reduce the heat to Medium-Low, cover the pot and let it simmer until the pasta is cooked (about 15 minutes). Stir it frequently during this time. Stir in 1/2 cup of the shredded cheese. Set your oven on the broil setting. Pour the pasta mixture into a 9 x 13 baking dish. Sprinkle the remainder of the shredded cheese on top. Place the baking dish on a high rack in the oven and broil it until the cheese is melted and slightly brown (about 3 to 5 minutes). * Note, fresh chorizo is soft so if you use like I did today, I found it easiest to do the following: Cut the chorizo sausage in half lengthwise. Cook the halves. Then slice them into chunks and return them to the pot. If you decide to remove the sausage casing, do so AFTER you have cooked the sausage. Otherwise you will essentially have spicy ground pork. Are you looking for a quick and easy meal? Who isn’t? I made this in dish in about 30 minutes and it was super easy. It won’t win any health awards, but sometimes it’s worth indulging in a meal like this one from time to time. All the ingredients are cooked in one pot, even the pasta! (Well, if you ignore the casserole dish for broiling the cheese on top.) I’m loving that because that means less dishes to wash. 😉 The sauce will thicken up quite a bit as it gets absorbed into the pasta. The end result won’t look like weird pasta soup like you see at this stage. Broil or not to broil? 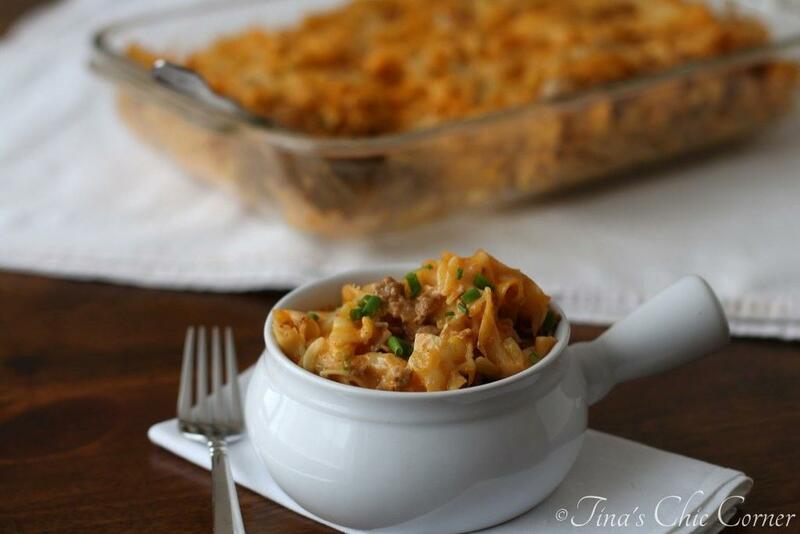 You can certainly save yourself the few minutes and a dirty casserole dish if you eat the pasta straight from the pot. However, I also love the magic of slightly browned cheese that you get from broiling it. You can’t go wrong either way. I don’t believe I’ve ever tried chorizo sausage. That may need to change because I love every other type of sausage I’ve had. Can’t go wrong with pasta either. 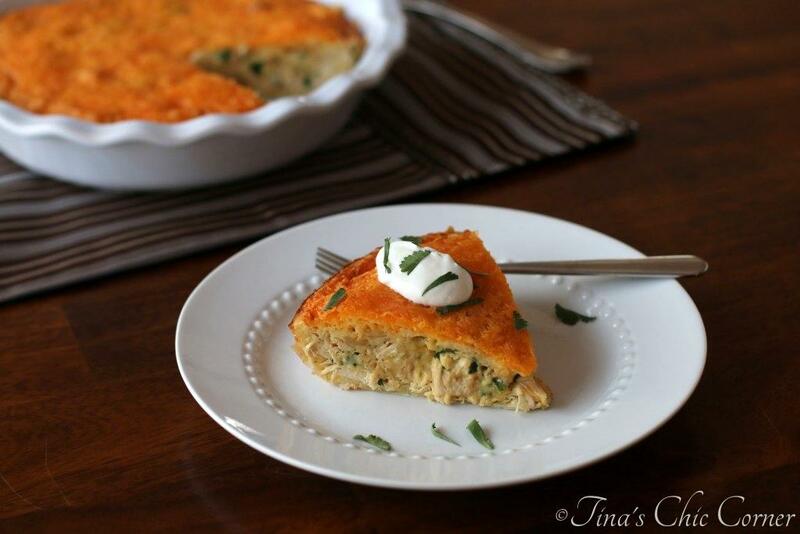 Looks like a great weeknight meal! I agree—Your pasta looks so chic! 🙂 Seriously, though, this pasta looks drool-worthy. May have to put this one on my dinner menu next week! 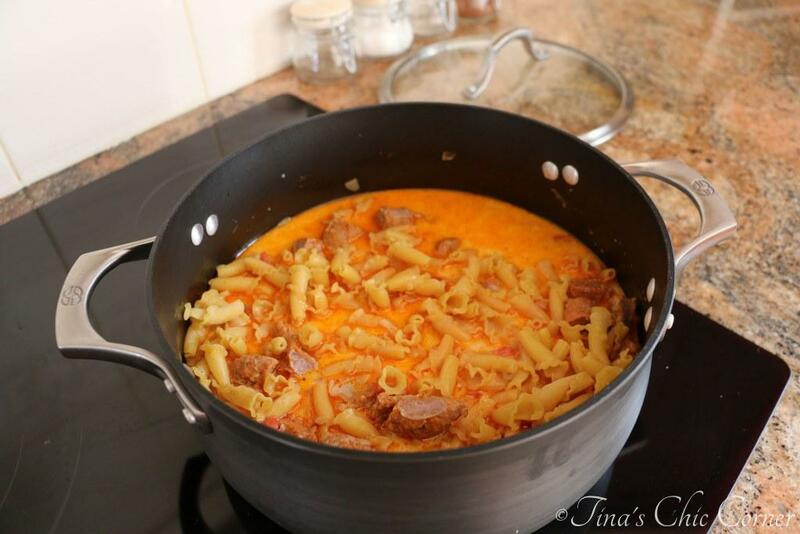 This looks really good Tina – I love Chorizo! This is cheesy goodness on a plate. I say yes please! I eat vegetarian most of the time since I hate working with raw meat. And I really dislike having people handling raw meat for me so yeah, I’m vegetarian most of the time. Though I do eat some meat sometimes and certainly lots of fish. Tina, I think I could have written that first paragraph. I HATE touching raw meat and I rarely cook meat. I just don’t like it enough to deal with all the hassle. But I couldn’t ever be a full vegetarian…sometimes I really need a steak! Ideally prepared by someone else 🙂 This is a great looking pasta dish! Yum! Yeah whenever I think of raw meat, I think of being a vegetarian too! I basically already am, but I just like seafood too much! I love how cheesy this looks- I’m not a fan of spicy food but this recipe still has me drooling! I’m with ya on seafood…love! Yes yes yes! I’m so feeling a big bowl of spicy pasta right about now! And I love chorizo! 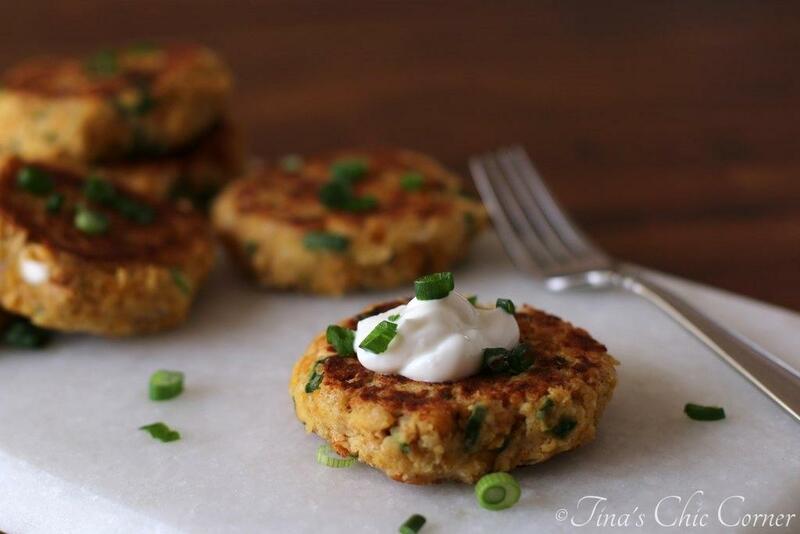 This sounds fantastic Tina! I used to think chorizo was “too spicy” for me when I was little, and haven’t really had it since. But a few weeks ago, I got the most amazing breakfast burrito with Chorizo in it. Delicious! Now I’m kind of obsessed with the flavor. Bet it’s even better in pasta! Love the idea of having it in a breakfast burrito! It has garlic, onions and tomatoes in it, Tina … so it’s definitely got some healthy stuff in there! I love anything with chorizo in it so I’d definitely give this a go! Me and raw meat – no.way. I’m exactly the same way – we eat vegetarian meals probably 5 days out of the week … to the point where I actually prefer them. But then there are certain dishes that I loveeee meat in … and would never give up! haha And this pasta looks like one of them! So much flavor going on! I’ve been thinking of making pasta this week. I haven’t had chorizo yet, but I know I would love this. There are times when I just crave meat too and times when I can’t stand it. Love this easy creamy pasta dinner!! Yummm! Slightly browned cheese is magic indeed! I don’t think I’ve used pepper jack in pasta dishes before, but I’m such a fan of it on sandwiches that I think this would be an instant fave! I’m not a vegetarian by any means, but I still get a little weirded out handling raw chicken. I must have really taken those food safety lessons to heart when I was younger…I think I’d prefer to wear a hazmat suit until everything is cooked thoroughly! Haha that’s what I always said…until I went vegetarian and realized I didn’t actually crave it ever…but that’s just me! I love that you used a pink sauce here! 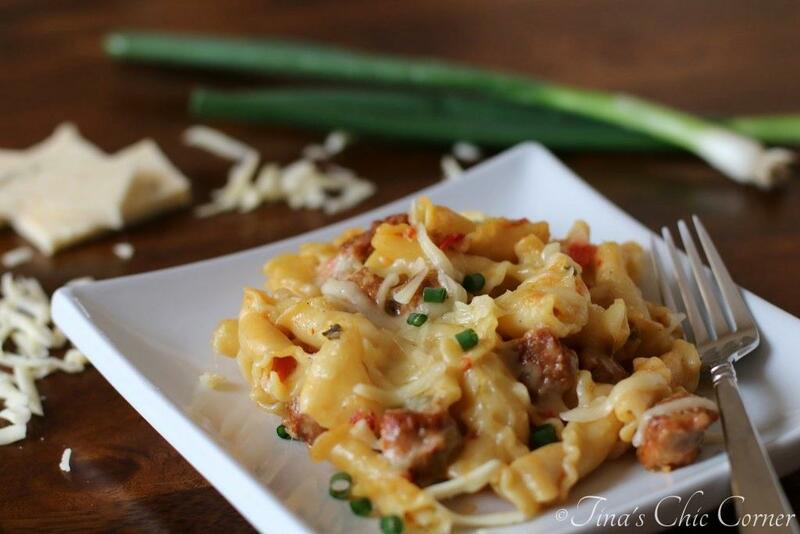 I adore spicy sausage in pasta, but hardly ever buy chorizo. That needs to change ASAP! 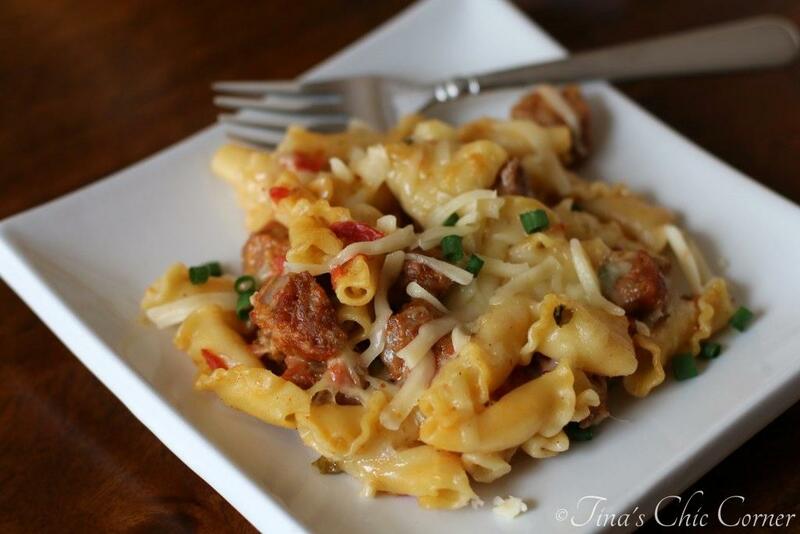 This pasta sounds so delicious and the chorizo addition! I’m not a vegetarian, but the only meat I eat is poultry. That’s because I’m allergic though. Sometimes I contemplate it but I think I would miss my chicken and turkey! I actually can’t eat chorizo (ugh) but I can stare at your pictures and think of how delicious it is! The Mr. describes these meats for me haha so I live vicariously through him. Omg, Tina… we are so alike! I am the same when it comes to meat. Too funny! 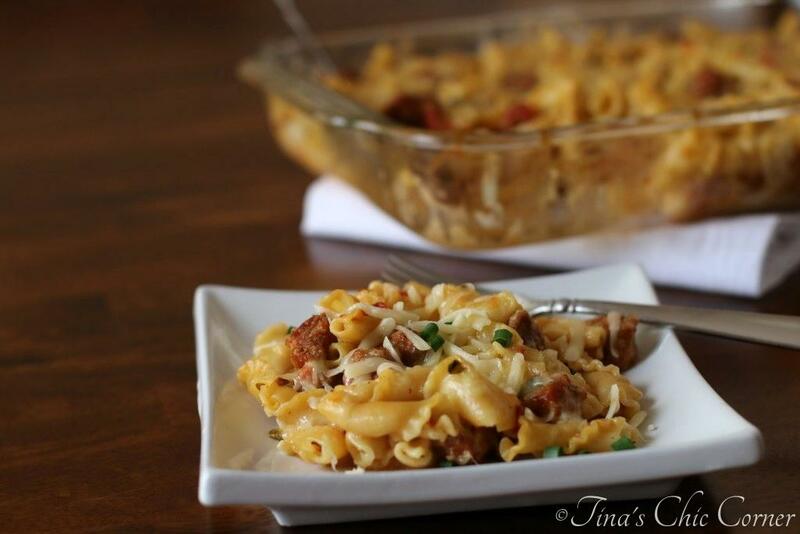 I’m all about the spice, chorizo, and pasta… so divine! Hehe, I am the same way when it comes to meat – I eat more veggies and fish but then there are days that all I want are hearty meatier dishes 🙂 This pasta looks wonderful – I like the sound of the spicy chorizo in here and can imagine the wonderful flavor it gives to this creamy pasta dish – yum!